Violaceous turacos (Musophaga violacea) at Atlanta Zoo - a fantastic photo from Trotz.com (© Joseph Trotz, 2008). This week's highlight taxon is the Musophagidae, a uniquely African family of birds that contains the turacos (or should that be "turacoes"? ), also spelt "touracos". Turacos are about 20 species of medium-sized frugivorous (fruit-eating) birds. The name of the type genus, Musophaga, means "plantain eater", which is also used as the vernacular name for some of the largest species, though it seems that they rarely, if ever, actually eat plantains (plantains, for those not in the know, are bananas eaten baked when they are still fairly green and contain more starch). Figs seem to a much more favoured food. Rutgers & Norris (1972) mentions them also feeding on leaves, insects and occassionally even meat, though it is unclear whether turacos actually eat the latter in the wild. Red-crested turaco (Tauraco erythrolophus), photo by Jhinuk Chowdhury from Tree of Life. Turacos are best known for their brilliant coloration, and not without reason. 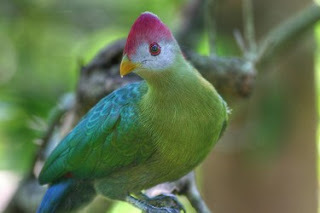 The red turacin and the green turacoverdin are unique among bird pigments in being metal-bearing porphyrins, the same class of compounds as the heme found in haemoglobin, though the turaco pigments contain copper rather than iron. Turacin is unique to turacos, while there is evidence that turacoverdin (or a very similar compound) is also found in the jacana (Jacana spinosa), the blood pheasant (Ithaginis cruentata) and the roulroul (Rollolus roulroul), a species of partridge (Dyck, 1992). Turacoverdin (and the pigments in the latter three species, if they are distinct) is also notable as the only truly green pigment known from any bird. Green coloration in other birds is the result of structural coloration (from the crystalline structure of the feathers), or the combination of yellow pigment and blue structural coloration (Hill & McGraw, 2006). Rutgers and Norris (1972) mention a persistent belief that turacin is water-soluble, and actually washes out when the bird bathes. While this belief is untrue, turacin is soluble in more alkali solutions. Great blue turaco (Corythaeola cristata), photo by Jon Clark from Travelpod. Turacin and turacoverdin are found in four of the six or seven genera of turacos. The genera Crinifer and Corythaixoides (together forming the subfamily Criniferinae) lack both pigments and are mostly grey. 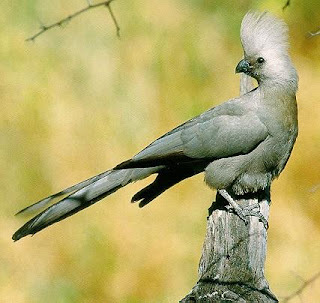 Species of Corythaixoides are also known as "go-away birds" after the sound of their calls. 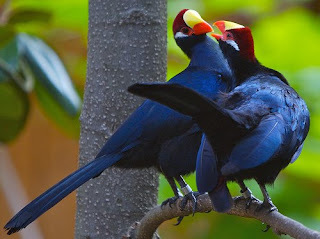 These two genera, as well as the great blue turaco (Corythaeola cristata) which is placed in its own subfamily, are referred to as the grey turacos. Corythaeola is also mostly grey, but does have small patches of turacin (the vent) and turacoverdin (a small breast-stripe). The remaining turacos, referred to as the turacin-bearing turacos, are included in the subfamily Musophaginae (Veron & Winney, 2000). Over half the species of turaco belong to the genus Tauraco, which are mostly a spectacular green. Tauraco, the purple-crested turaco (Gallirex porphyreolophus)* and the Ruwenzori turaco (Ruwenzorornis johnstoni) contain both turacin and turacoverdin (the latter two species may be included in the genus Musophaga). The remaining species of Musophaga in the strict sense lack turacoverdin and are a brilliant blue colour, with bright red crests coloured with turacin. *Gallirex is a very neat genus name - it means "king of the chickens". Grey go-away bird (Corythaixoides concolor), photo from Animal Pictures Archive. The relationships of the turacos to other birds have long been problematic. The most common position attributed to them has been as sister taxon to the cuckoos (Cuculidae), but other suggested relationships have been with the Galliformes or Opisthocomus (the hoatzin). The morphological analysis of Livezey and Zusi (2007) supported the traditional position, while the molecular analysis of Ericson et al. (2006) placed both Musophagidae and Cuculidae in a grade of largely terrestrial birds, also including the Grues (cranes and rails) and Otididae (bustards), sitting at the base of the mostly aquatic "higher waterbird" clade, but was unresolved to whether the two families formed a monophyletic group. Dyck, J. 1992. Reflectance spectra of plumage areas colored by green feather pigments. The Auk 109 (2): 293-301. Hill, G. E., & K. J. McGraw. 2006. Bird Coloration. Harvard University Press. Rutgers, A., & K. A. Norris (eds.) 1972. Encyclopaedia of Aviculture vol. 2. Blanford Press: London. Veron, G., & B. J. Winney. 2000. Phylogenetic relationships within the turacos (Musophagidae). Ibis 142 (3): 446-456. Now those birds are just plain adorable. 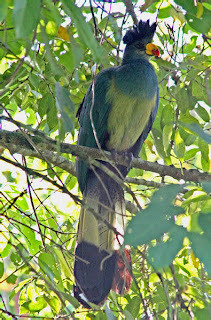 Thanks for using my image of the violaceous turacos - but could I ask that you (a) add a copyright [©2008 Joseph Trotz] as all contents of my site are copyright? 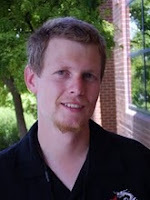 I will change the rights for this image on Flickr to allow for creative commons usage to allow this. Thanks again for using the image! Done. My apologies for the inconvenience. 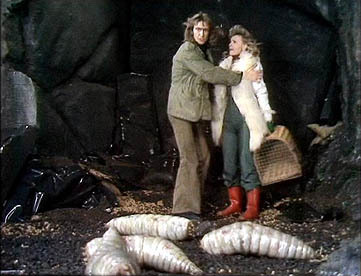 This is as good a place as any to once again point at that it is also Catalogue of Organisms policy that the author of an image has the right to ask for its removal from the site at any time.